Womxn Paint, with support from StreetARToronto, is hosting a second jam on August 10 to 12 and August 18 to 19th , 2018, in the laneway between 136 McCaul St. and 39 D’Arcy St. A talented mix of 25 emerging and mid-career artists have transformed more than 3,500 square feet of space into murals responding to the theme “Uplifting Each Other”. As a closing celebration, community members, mural enthusiasts and interested Torontonians are invited to meet the artists and be inspired by the murals on Sunday, August 17 from 4 to 7 p.m.
See the full list of participants on the Womxn Paint website. laneway between 136 McCaul St. and 39 D’Arcy St. Some two-dozen students have made it to the semis of the Adobe Design Achievement Awards (ADAA)! OCAD U is always well represented in this international competition for creative students of all disciplines. Categories include illustration, photography, package design and 11 more. To see all of our finalists, go to the ADAA website and filter for OCAD U students. For additional competition updates, follow the action on social media: @adobeawards. 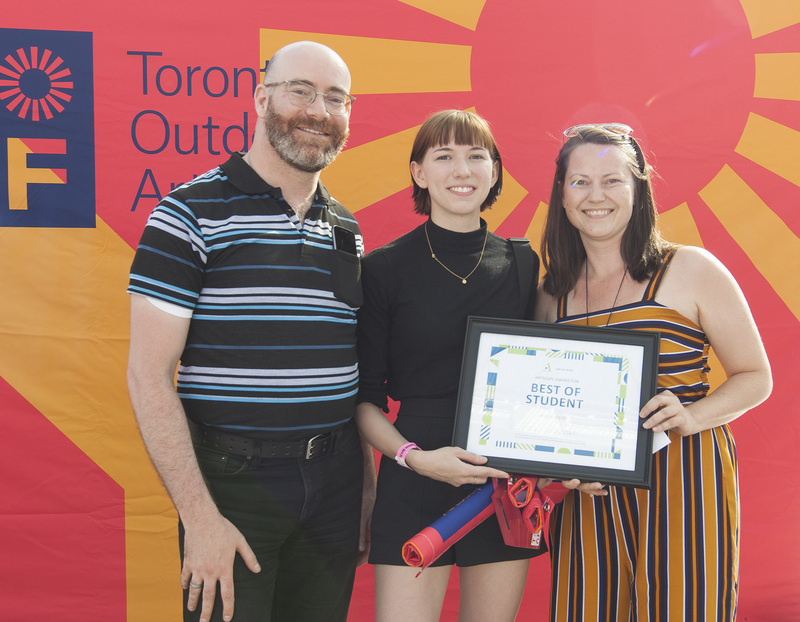 Students and alumni from OCADU’s Illustration and Sculpture & Installation programs were among award winners at the 2018 Toronto Outdoor Art Fair (TOAF) in Nathan Phillips Square in July. The three Illustration student winners were all recipients of the OCAD U TOAF Career Launcher opportunity, coordinated by the Centre for Emerging Artists and Designers (CEAD). Judged by house of i.d.e.a. Value of Artwork by house of i.d.e.a. Fourth-year Illustration student Eryn Lougheed has completed a stairwell mural in 230 Richmond St. W. for the second annual Hullmark Stairwell Mural Career Launcher, a partnership between OCAD U’s Centre for Emerging Artists & Designers and the university’s development and property management collaborator, Hullmark Developments. To see the mural, from the main entrance, take the stairs left of the elevators. On the third floor, pass the mural by Adam De Souza (2017 Career Launcher muralist). Enter the third floor, cross over to the south stairwell by walking around the elevators. Walk down one flight to find Eryn’s mural in the north exit passageway of the building. Congratulations Eryn! Read more about her work in this article from Intern magazine. 3x3 Magazine has awarded gold, silver and bronze awards to OCAD University Illustration students! Additionally, 6 other OCADU pieces were awarded honourable mention or merit. All will be published in 3x3’s No. 15 Annual. Two illustrations from OCAD U students were also selected for Creative Quarterly 52. This brings our current tally of 2017/18 student awards to a record 54! And congratulations to our Creative Quarterly winners, Hannah Kim (3rd yr) and Jinke Wang (4th yr)! 3x3 is the first publication devoted entirely to the art of contemporary illustration. Published in the United States and distributed worldwide, its sole interest is in sharing what’s shaping international illustration. Creative Quarterly is an international journal focussing on promoting the work of the creative community. Creative Quarterly is pleased to announce the winners of CFE 52. All winners will be exhibited in Creative Quarterly, on the newsstand Spring 2019. The winners and runner-ups work will be posted on our Online Gallery in Spring 2019. Results from several industry competitions have just been announced! 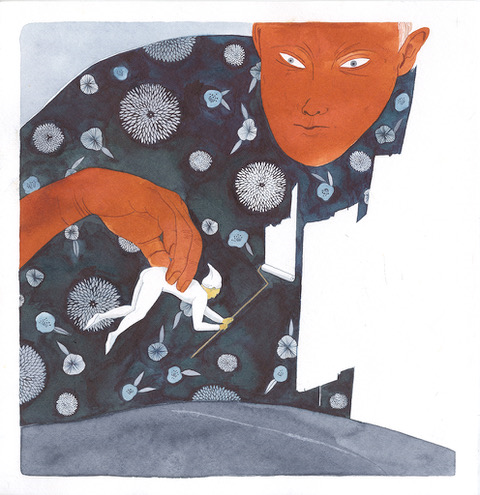 Congratulations to 4th year students Aliya Ghare (see above image), Jinke Wang, Francesca Chan, and 3rd year student, Lily Snowden-Fine, all of whom have work chosen to appear online as part of The American Illustration archive at ai-ap.com. Their illustrations were among 315 images chosen from over 8,000 submitted worldwide. This year’s distinguished jury included: Damien Correll, Google; Jim Datz, The New York Times Op-Ed; Phoebe Flynn Rich, Rachel Ray Everyday; Alison Forner, Simon and Schuster; Na Kim, Farrar, Straus and Giroux; Michael Mrak, Scientific American; and Ivylise Simones, WIRED. Toko Hosoya, 2nd yr student, was awarded The Society of Illustrators 60 (Professional show), GOLD AWARD, for the Uncommissioned category. Toko also had work chosen for the 2018 Student Scholarship Exhibition. Lily Snowden-Fine was awarded for 2 pieces and is the recipient of the Nancy Lee Rhodes Roberts Scholarship Award which comes with a $5,000.00 cash prize. Exhibiting this May in New York’s Museum of American Illustration with Toko and Lily, will be 4th yr students Adam De Souza and Jisu Lee, 3rd yr student Eryn Lougheed Crowell, and 2nd yr student Mia November. The winning images were selected from 8,700 entries submitted by American and Canadian universities. A jury of professional peers, including illustrators and art directors chose the most outstanding works created in 2017-18. Andrew Watch, ILLU 2017, won the BRONZE AWARD and a Merit. Varvara Nedilska, 3rd yr student, won a Distinguished Merit and 2 Honorable Merits. Adam de Souza was awarded a Distinguished Merit and multiple Honorable Mentions. Aliya Ghare, Cindy Lee, Cameron Miller, Ann Sheng, Lily Snowden-Fine were awarded Merits. Varvara Nedilska and Cindy Lee, ILLU 2017, both won multiple Honorable Mentions, while Jisu Lee and ILLU 2017 graduates Christopher Dupon-Martinez, Anna Kwan and Adam Marin were awarded individual Honorable Mentions. 3x3 is the first publication devoted entirely to the art of contemporary illustration. Published in the United States and distributed worldwide, its sole interest is in sharing what’s shaping international illustration. Francesca Chan and Jenn Woodall, 4th yr students, were runners up for CQ51. Sarah Mason, 4th yr, was a winner and runner up, while Olivia Di Gregorio, 3rd yr, and Cameron Miller, ILLU 2017, were runners up for CQ50. Erin McCluskey, ILLU 2017, was a runner up for CQ49. And Janine Kwok (4th yr) and Chris Tu, 3rd yr, were runners up for CQ48. Varvara Nedilska and Eryn Lougheed Crowell won student awards for 2017. Winners for 2018 will be announced in the summer. Applied Arts has been published in Canada since 1986 to a readership of 46,000 creative and marketing professionals. Read more about Results from several industry competitions have just been announced! 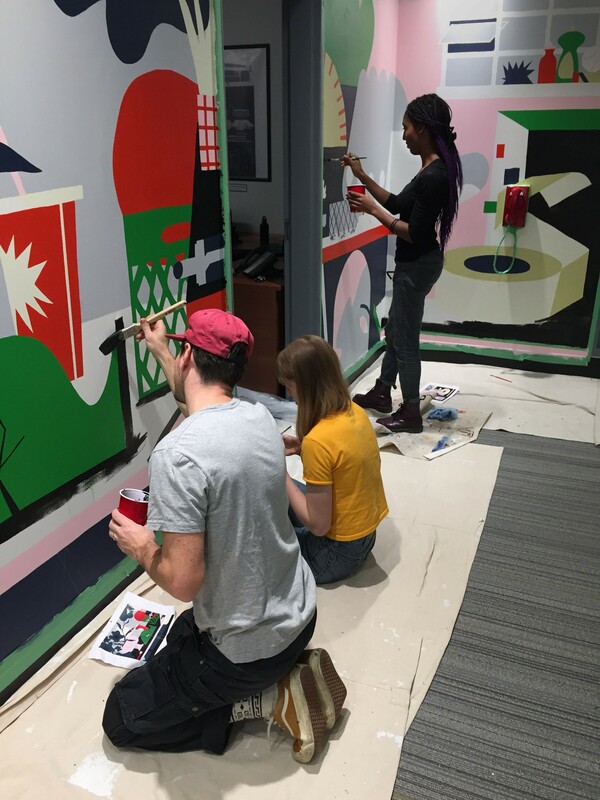 When you step off the elevator on the ninth floor of 230 Richmond St. W., your field of vision is filled with the vibrant colours of a mural that leads to the Faculty of Design offices. Designed by alumnus and sessional instructor Adrian Forrow, the mural is the result of a project led by Jody Hewgill, Assistant Professor in the Illustration program. The project began with a presentation of several OCADU alumni illustrators and recent graduates’ work. Forrow was chosen for his colourful bold imagery and his compelling design aesthetic. Hewgill recruited three current Illustration students to apprentice with Forrow and help execute the mural. Through a workshop framework, students learned mural techniques such as taping and frisketing, and how to translate an illustration to mural scale. The conceptualization, sketching, rendering and approval of the initial image took approximately two weeks to complete, the mural itself took five days to paint. The signage was designed by Hewgill. The letters were cut on the CNC mill by Darrell Currington, then sanded, painted and assembled by Industrial Design student monitor Shayn Martens. The Faculty of Design Office is proud to show off the new mural on the outside walls of 230 Richmond Street, 9th Floor. 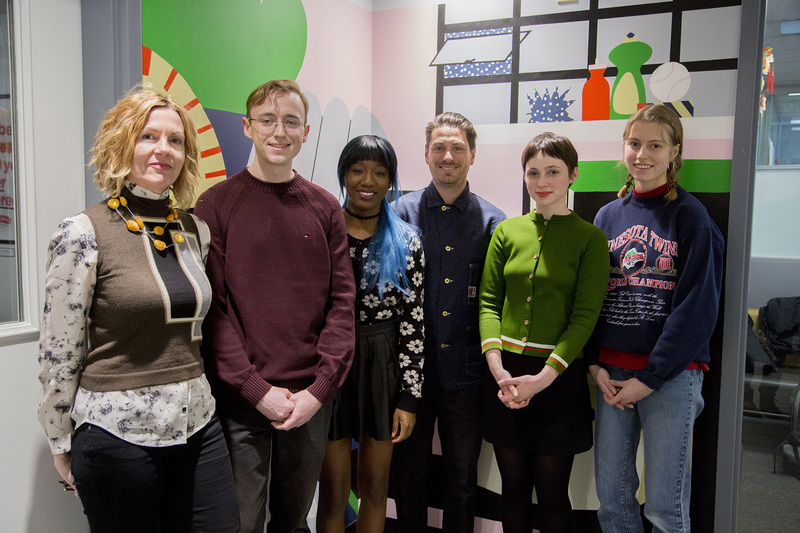 Thank you to Ilustration Chair Paul Dallas, Assistant Professor Jody Hewgil and Instructor Adrian Forrow as well as, illustration students: Ene Agi; Sarah Mason; Lily Snowden-Fine. Making the new FoD sign was Shayn Martens from our Industrial Design Program. Wearing his signature green fedora, illustrator Barry Blitt spoke to a packed auditorium of guests, students and faculty at the President’s Speakers Series talk on February 28. The semi-autobiographical presentation included more than seventy images, capturing his process and evolution as an illustrator, and the challenges of working on breaking news stories for national publications. Especially well-known for his covers of the New Yorker, Blitt’s style is instantly recognizable; a loose, pen and watercolour technique that would be as well-suited for 1928 as for 2018. President Trump has been a frequent subject for the past several years, someone Blitt considers a gift to satirists. The humourous, self-deprecating talk concluded with a Q&A session with the audience. Students from the Illustration program quizzed him on how to start a career in the field, and others inquired about how he tackles difficult political subjects. The questions continued well past the allotted time, so Blitt returned the following day to speak with Illustration students. Barry Blitt graduated from OCA in 1982, moving to the US a few years later. He has since become a US citizen and lives in Connecticut.